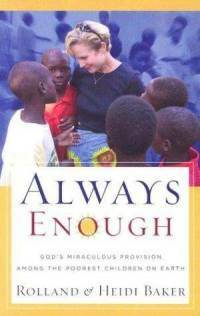 I have started reading the book, "Always Enough." Written by Rolland & Heidi Baker, the missionaries that started the orphanage/resource center that I will be visiting in Mozambique, Africa. It is a book our team has been asked to read before we go on the trip, but I recommend it to everyone!! The book is about their life, how they got together, and their journey to become missionaries in Mozambique where they have started thousands of churches and multiple orphanages where they take in unwanted children from the street. It is all about living by faith from day one. The subtitle on the front of the book quotes, "God's miraculous provision among the poorest children on earth," and that is exactly what is happening. They live everyday not knowing how they will eat, or how they will provide for all of those children, but everyday the Lord comes through and provides in amazing ways. What would it be like to live a life of faith....REALLY!!?? Not just living a life that is faithful to the Lord, but living a life that is fully reliant on the Lord and HIS faithfulness. Living everyday knowing that you have no means to live by, but you have to trust in the Lord to come through and provide for you...and your family...and anyone else that you are responsible for! In their story, some may shake their head in dismay at circumstances they put themselves in to get on the levels of those living in slums, and depravity, especially since THEY HAVE THEIR OWN CHILDREN! Right, I mean that is how we think....it's okay if it is just you and your husband but if you have children you have to think more rationally and be smarter...right? NO!!! God can provide for your children just as he can provide for you! If you want to be shaken and stirred up, READ their story....I am only a little ways in, but God is stirring my heart to trust him more!